Deep insights and business KPI’s help Braintree users grow their business effortlessly. Putler directly integrates with Braintree and provides metrics, forecasting and insights that speed up business growth. Why a reporting solution like Putler a must for Braintree users? The standalone Braintree reports provides you transactions data. Putler takes this data a notch higher. It processes transactions from Braintree and provides strategic insights and reports. Braintree users can then use these reports to take important decisions and grow their business. The settlement batch summary report displays the total sales and credits of each batch. Here, each batch are the credit card transactions that have been submitted for settlement. You can click on the link for each settlement batch to view its individual transactions. The decline analysis report gives you a list of declined transactions that helps you spot out fraudulent transaction early on. Collecting cardholder names or email addresses with transactions can help spot fake ones easily. The expiring cards report is useful for business with recurring billing. This report generates a list of credit cards that have expired or those that will expire within the next month. This, in turn helps send out email reminders to customers to update their information. This report is for tax purposes. It includes the gross sales volume coming from credit/debit cards. It doesn’t include credits, refunds, or chargebacks. How Putler and Braintree work hand in hand? As you can make out from above, Braintree gives you amazing transactions reports and sales overview. However, there are no insights regarding products, visitors, customers. Putler fills in this gap. It processes the transactional data and shows reports on products, customers as well as online visitors. The basic search feature loads up transactions very slowly. Also, searching by a PayPal account payer email will not yield any results. Right? Putler provides an advanced search option for a quick transaction lookup. It saves you time, energy and lets you run through multiple records within seconds. Putler can also predict data. It takes into account your transactions from Braintree and plots a forecasting graph about your sales, number of customers and growth metrics for a period of 1 year. In short, Braintree and Putler work great together and help you achieve remarkable results! Is Putler the best reporting solution for Braintree? Is Putler the best reporting solution? Now that’s subjective. But here are some facts..
Putler is an exhaustive reporting and analytics solution for your Braintree transactions. It provides insights and KPI’s missing in traditional Braintree reports and assists you to grow your business. Connect your Braintree accounts to Putler and you will come across instantly useful insights and metrics to grow your business. Multiple accounts consolidation: Connect multiple Braintree accounts to Putler and view all your business stats at a single place. Not just Braintree, you can connect other payment gateways, shopping carts to Putler and view insights for your business. This includes PayPal, WooCommerce, Stripe, Shopify, etc. Individual and aggregated data: If you have connected multiple accounts / platforms, you can view combined as well as individual reports for each one of them. Instant transactions lookup: Type your desired search query and all transactions related to your query with complete details will be brought up at a lightening speed. Complete product reporting: Know every bit about your products – top performers, best time of sales, product vise refunds, etc. RFM analysis & customer segments: Get to know each of your customer segment. Loyal customers, lost customers, customers needing immediate attention, complete customer details, etc. Issue refund: Using Putler, you can issue refunds directly to customers in seconds. 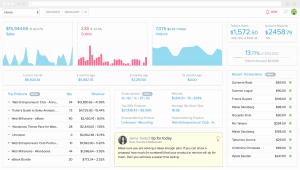 In addition, you also get visitor insights, personalized insights, forecast values and a lot more in Putler. Tracking your business transactions is good and Braintree has done a fabulous job in generating those reports. But by combining this data in Putler you can open a treasure chest of KPI’s and insights that can help you take important decisions in your business.